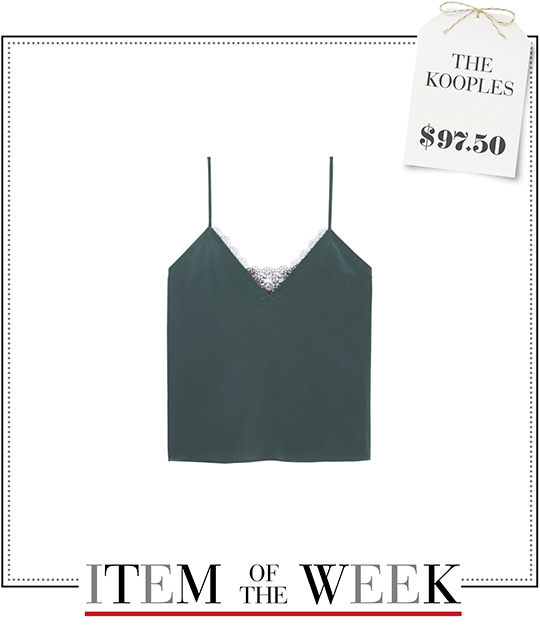 A lace-trimmed silk camisole from The Kooples. See how you can coordinate your wardrobe in 5 different ways with 1 item, under $100. Monday Dinner Plan: Add fashion-forward flair to your dinner style with today's urban cool outfit. 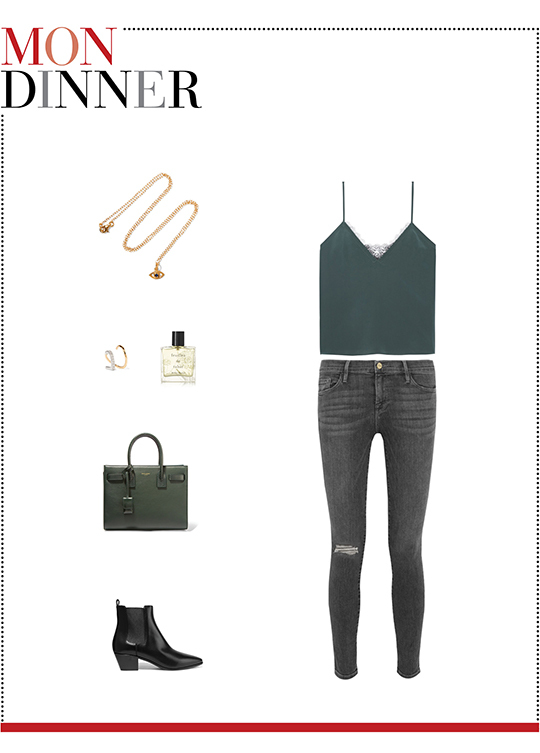 A pair of gray skinny jeans, an eye pendant necklace, a diamond twirl earring, a green mini tote, black ankle boots, this week's green khaki camisole, and citrusy perfume create that minimum effort, maximum impact appeal. Tuesday Office-friendly: Mix sharp tailoring with a touch of tribal to win the summer office style game. Pair The Kooples' silk cami with a fringed tweed pencil skirt and a buttonless crepe blazer. Next, accessorize with a pair of pointy bow flats, a long pearl necklace, and a gray shopper tote. Finally, complete your look with Monday's fragrance and some lip balm. Wednesday Date Night: Solve all your date night dressing dilemmas with these undeniably seductive evening essentials: a fluted lace skirt, a pair of bright pink statement earrings, a studded shoulder bag, ankle-strap stilettos, glittery nail polish, voluminous mascara, and this week's lace-trimmed silk cami. Thursday Hot: Looking chic in the heat doesn't require too much effort. Use these steps to build an effortlessly cool August outfit. First, slip on The Kooples' delicate silk camisole and match it with a mini denim skirt. Second, slide your feet into a pair of black flat sandals and throw over your shoulder a burgundy leather bag. Third, put on a pair of cat-eye sunglasses and finish your look with a leather bracelet and some sunscreen. Friday Nightlife: Make a stunning entrance at your next after-dark festivity by dressing up in this attention-grabbing party ensemble. 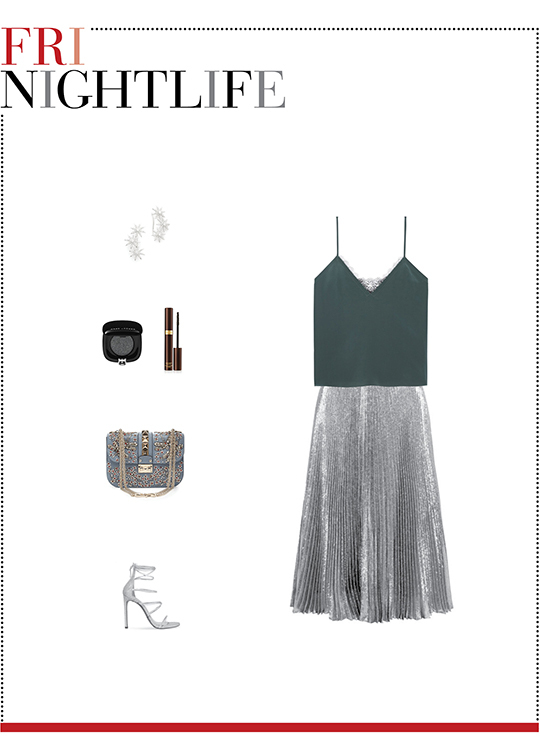 Coordinate this week's lace-trimmed cami with a silver pleated skirt and accessorize your look with a pair of star ear crawlers, an embellished shoulder bag, and sparkly strappy sandals. As for makeup, put on some smoky eyeshadow and Wednesday's mascara to give your look a glamorous finishing touch.